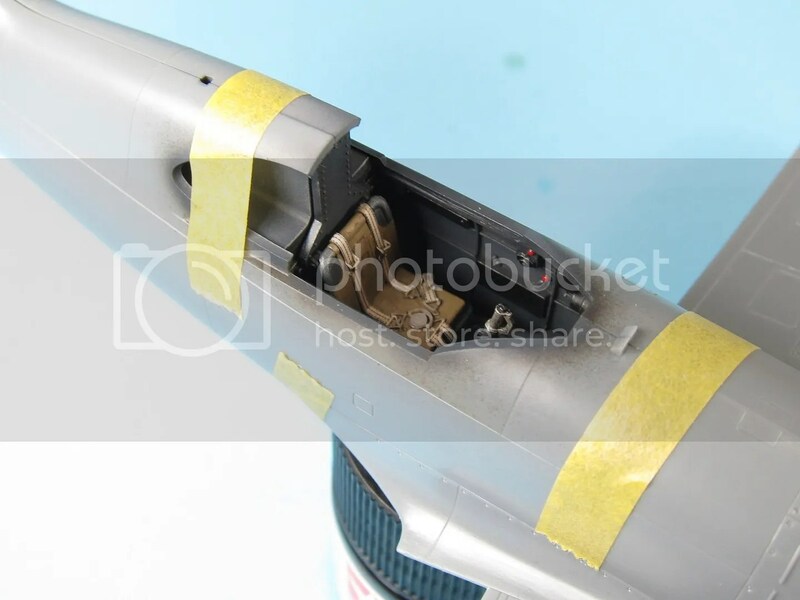 Like the other two-sprue wonders Tamiya put out during the mid-90s, the Dewoitine D.520 has a competent-if-not-amazing cockpit. The general sense I got one was one of incompleteness. The detail that’s there is well done, but it feels like Tamiya got to a certain point and said “eh, good enough”. Or whatever that is in Japanese. The main cockpit consists of seven parts – the cockpit floor, control column, rudders, instrument panel, seat, pilot’s bulkhead, and a rear insert-thing that fills the space behind the seat. 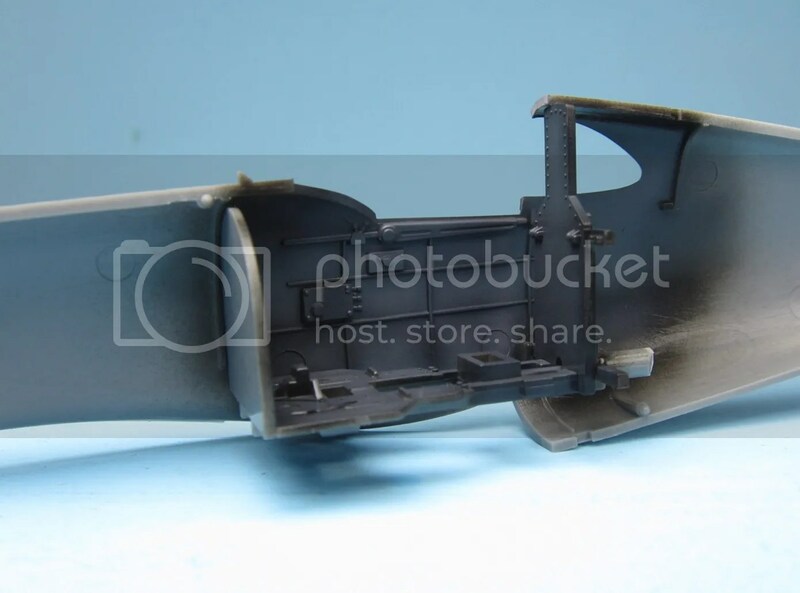 There’s also the gunsight and the detail molded into the fuselage sides. I will admit – there’s a powerful temptation to go all AMS on this cockpit. 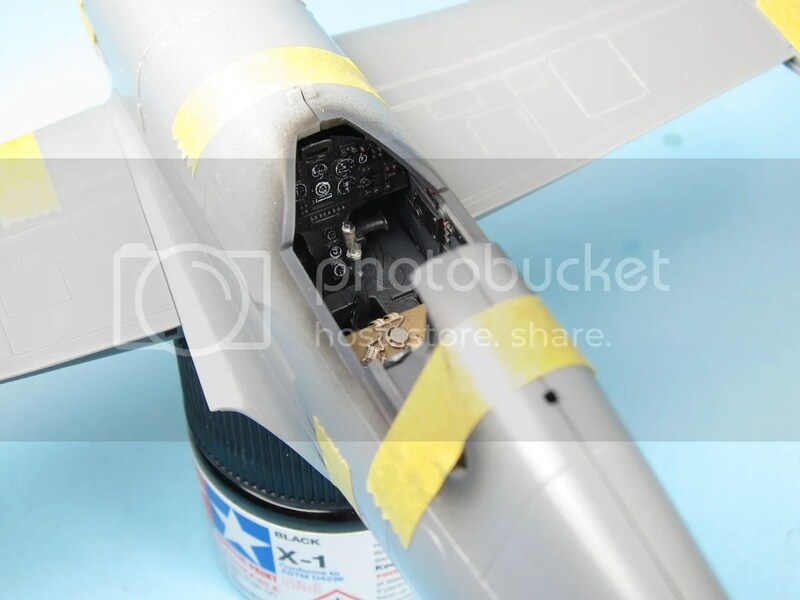 But – in addition to wanting more of a quick-and-fun build, the dark gray interior color and shape of the airframe mean that there’s not a ridiculous amount readily visible with the fuselage closed. I started work on the cockpit by using my favorite new technique and spraying everything black (Tamiya X-1), then going over it with highly-thinned Dark Gray (Tamiya XF-24). Is this correct? Hell if I know. 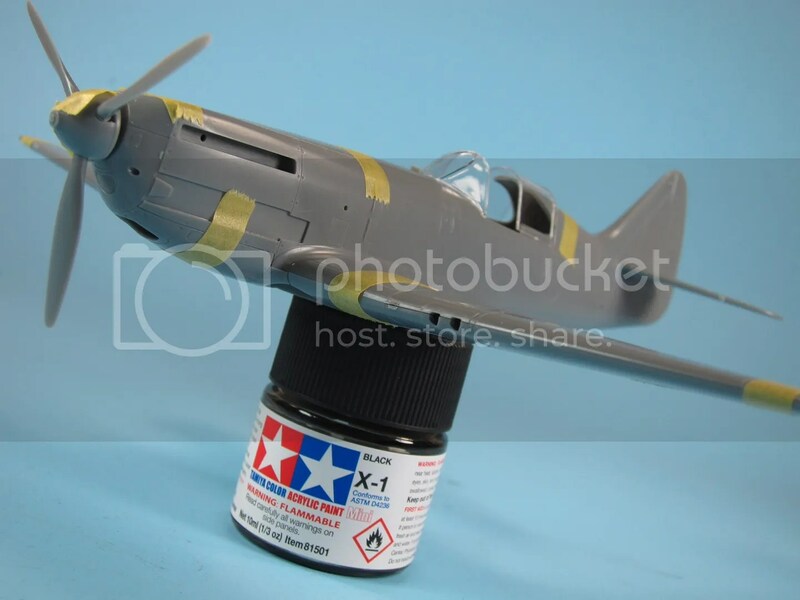 The instructions called for XF-24, and since I’m keeping this one as a strictly relaxation build, I’m not sweating things like painstaking accuracy in the cockpit colors of French WWII aircraft. The kit’s decal sheet includes two decals to cover the instrument panel. They do the job, just, though in retrospect I would have been better served by using Airscale guage decals. The kit decals were less than fun, and make me very happy I decided to buck for an aftermarket sheet for the exterior markings. Once the decals were set, I topped each gauge with a dot of Micro Kristal Klear, and drybrushed the surrounding detail. A few bits were picked out in red to add visual interest. I decided to keep the weathering fairly light on the D.520. Some drybrushing with Model Master Dunkelgrau + Floquil Old Silver and a wash of raw umber artist oil. Nothing fancy. One of the most prominent features of the D.520 cockpit – and most any cockpit, really – is the seat. In the Dewoitine the seat’s especially prominent, being the only thing that’s not all in dark gray. To recreate the fabric that covered the seat’s tube frame, I first painted it with Vallejo Khaki. I put this on thick and stippled it so it dried somewhat coarse. It helped, but the Vallejo was way too uniform. So out came the Iwata HP-C+ and some heavily thinned Tamiya Deck Tan to add some variation. Then some dot filtering action with artist oils. I also found a set of Eduard photo-etch French harnesses. No idea what else I’d ever use ’em on, so on they went. For a simple, relaxing build, this was definitely a simple, relaxing cockpit. Up next – melting plastic together until it resembles a miniature airplane!